The protagonist of City Hunter. Ryo is a combat expert, having fought as a guerrilla in numerous conflicts alluded to throughout the series, and has a long history of working in the underground. He carries a Colt Python. His mysterious past starts with him being the only survivor of a plane crash in Central America as a toddler. The crash left him an orphan in a rebel village during a civil war, prompting him to learn to fight at a young age. As a result, he has very little information on his true parentage, or even his birthdate. (Later, Kaori Makimura unilaterally declared March 26 his birthday, as that was they day they first met). After the war he ended up in the United States, where he worked as a hired gun, but eventually he found his way to Tokyo, Japan. 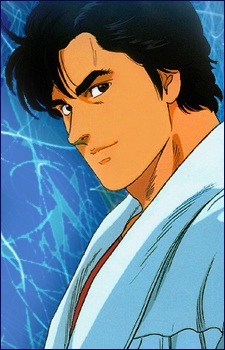 There he formed the "City Hunter" team with Hideyuki Makimura (Kaori's brother), and it's sometime after that where the manga/TV series' timeline begins.